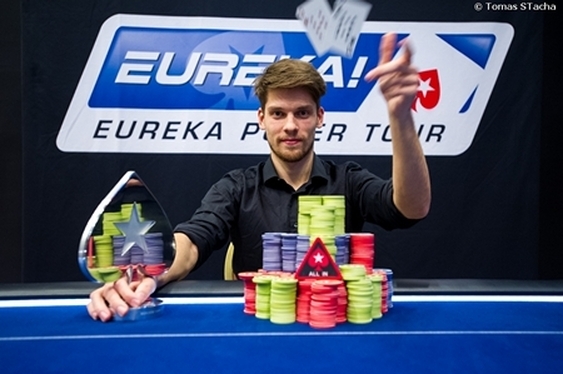 As the lights began to go down on the largest ever PokerStars Eureka Poker Tour event a flurry of activity eventually saw Dmitri Holdeew rise from obscurity to clinch the title. Having started the day amongst the chip leaders but overshadowed by the dominant stack of Ami Barer, Holdeew was able to hold his nerve as the session progressed until he saw his moment to strike. In the early stages of the Prague finale a string of eliminations, including Marcin Horecki and Mark Dalimore, eventually led to Barer and Holdeew contesting a three-way battle with the UK's Stephen Chidwick. With Barer and Chidwick arguably the two most accomplished players at the table, things certainly weren't looking good for Germany's Holdeew. However, as the action developed it was a case of England vs. Germany and, in typical fashion, it was the latter that eventually enjoyed the rub of the green as Holdeew's pocket sevens held up against Chidwick's Ks Tc. Having dispatched with the first of his foes, Holdeew then engaged in a veritable rollercoaster heads-up match with Barer as the chip lead changed hands multiple times. As chips flew emotions began to rise and on the final hand an exasperated Holdeew finally let out a cry of "F**k yeah" as the Td 3h 7c 9h Kd board was enough for his Ts 9d to beat Barer's Kh 4h and claim the final pot. With all the chips in play now in his possession a relieved Holdeew could finally relax and crack a smile as the winner's trophy and €226,400 top prize was pushed into his arms.